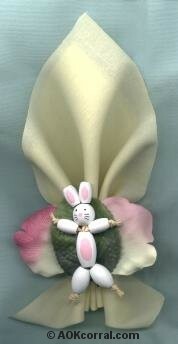 Learn how to make this adorable little bunny with spring leaves or flower petals on a napkin ring. Perfect for a spring table setting. Make another with 3 more strands of raffia. Thread one of the oval beads (1/2" x 3/4" - legs) onto the raffia strands and slide them down to the knot. Next, thread all six strands of raffia through the larger oval bead (9/16" x 1" - body) and slide the bead down to meet the other beads (legs). To make the arms, take two of the six strands of raffia and thread 1 of the smaller oval beads (9/16" - arms) onto it. Slide the beads to the end of the raffia strand to meet the large oval bead (9/16" x 1" - body). Tie a knot in the raffia strands at the end of the "arm" bead. You may need to tie this knot more than once so that it will be a large enough knot to keep from slipping through the hole in the small oval beads. Repeat steps 6-8 above for the other arm. Thread the last two strands of raffia through the round bead (16mm - head) and slide the bead to meet the large oval bead (9/16" x 1" - body). Thread one small oval bead (9/16" - ears) over each strand of raffia to form the ears. Tighten the "ear" beads down onto the head and pull the raffia strands tight that are now at the back of the neck. Tie a knot in the raffia strands at the back of the neck. Again, make sure that you tie the knot enough times to keep it from slipping into the hole in the bead. Trim the ends of the raffia strands so that 1/4" to 1/8" is sticking out beyond the knots. Clear coat your bunny with varnish. Take a plain napkin ring, (wood is good) center a green leaf and/or some flower petals to the napkin ring and glue in place. Place a large dot of glue on the leaf/flower with the center of the napkin ring behind it. Attach the body bead of the bunny at the glue dot. These bunny napkin rings will make your spring table setting something to remember.